I am both the one in the hole and the one with the weapon. It will be a wonderful day when I hold the book in my hands, and all this egregious checking is out of the way. Then I’ll no doubt find a typo, and hit myself over the head with that. I for one appreciate your determination. Thank you Sean. There are some wonderful poems, ranging from ones written this year, to nineteenth century works. I sometimes take a break from checking details and read some of them, to remind myself why I am doing this in the first place. 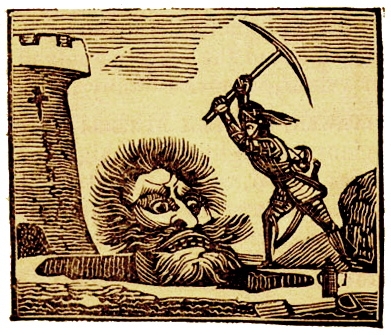 The giant in the picture is called Cormoran, by the way, if you want to look him up. Wonderful photo of you Penelope…like the on in the hole best! Good luck with completion of the anthology…sounds like you are very focused. And I am changing my name to Focus, Helen! I sometimes think it’s a little reminder that we’re mortal. perfection is not for the likes of us!